In this post I show how the virtual cursor is used and a routine to put single characters in a window. The functions introduced here are part of LIBWIN.ACT. The contents of my library, as well as an API reference, will be released in its entirety at the conclusion of the posts. The functions for this post are position (WPos) and put (WPut). Window handle number (n) – This also accepts WPABS which directs the position function to move the virtual cursor to an absolute screen position rather than a window based position. WPos returns either 0 (good) or an error code. First, a default return code of 0 (good) is set. Next the window handle is checked to see if it is WPABS. If it is, the virtual cursor position is set to the x and y coordinates specified, which are absolute screen coordinates, not window coordinates. If the window handle is not set as WPABS, the window handles memory location is computed. The window handles status is then checked. If the window handle status is free, the routine sets the return code to the error code NOT OPEN and exits. 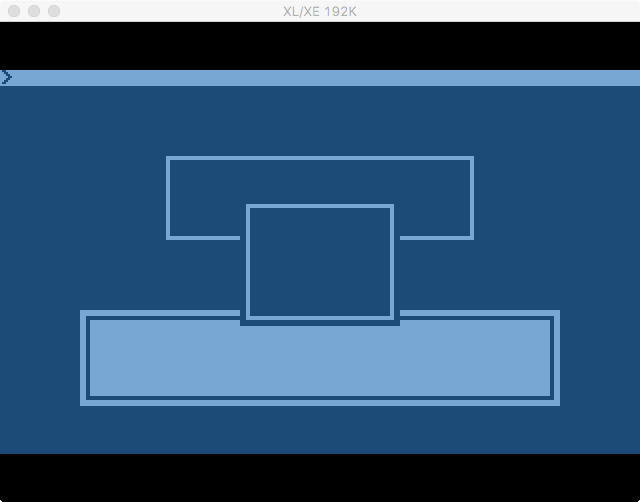 If the window handle status is uses, the virtual cursors x and y positions are set relative the the windows frame coordinates. The routine then exits. Character value to print (x) – This should be an ATASCII code. It will be converted to internal code. The routine will return 0 (good) if successful, otherwise an error code. First, a default error return code of NOT OPEN is set. Next, the byte value passed is converted to a string. Then the window handles memory location is computed. The window handles status is then checked. If the window handles status is free, the routine exits returning the previously defined error code of NOT OPEN. If the window handles status is not free (in use), the routine converts the string to internal code from ATASCII code. If the windows inverse flag is set, the string is inversed. The screen memory location is computed, and the string (byte) is moved to that location. The virtual cursor position is then incremented by one just like a real cursor. A return code of 0 (good) is set and the routine exits. The previously used demonstration program is expanded here to demonstrate WPos and WPut. Notable differences are the WPos() lines and WPut() lines. After the third window is cleared, WPos and WPut are used to draw a line of asterisks in the window. The next post will include a function for getting the status of a window handle. If no errors are encountered it returns 0 (good). If an error does occur, it returns the error code. The print routine works as follows. First a default return code of error status NOT OPEN is set. Next the address of the window handle is computed. Then the status of the windows handle is checked. If the windows status is free, the routine exits with the default error code previously set. If the windows status is used, the passed string is copied to a temporary buffer. I check is made to ensure the length won’t exceed the windows right boundary. If it will, its truncated. Next the string is converted to internal character code from ATASCII because it will be copied directly to screen memory. Then if the inverse flag is set, the string is inversed. The screen position in memory is then computed. If the x parameter was specified as WPCENT, the text will be centered, otherwise it will be placed at the x position specified. The temporary string is then copied directly into screen memory. The return code is set to 0 (good) and the routine exits. ; Add width-length/2 for centered x. Next, the address of the window handle is computed. The handle status is then checked. If the window status is free, the routine exits passing back the previously defined error code of NOT OPEN. If the window status is used, the top left position for the contents of the window (inside border) is computed. An empty string is created for the windows content width (not frame width). If the window has the inverse flag set, the empty string is inversed. Line by line the empty string is then copied directly into screen memory. Finally, the return code of 0 (good) is set and the routine exits with the return code. To demonstrate these functions, I’ve added on to the same demonstration program used in previous posts. A couple of minor changes were made to the window sizes to make them taller so they would overlap more, purely cosmetic. The notable additions to the program are the WPrint() lines, the WClr() line, and the addition of another keystroke wait. This also demonstrates the usage of centering with WPrint(). The second “Hello” in window 3 is centered, as is “Inverse ATASCII Podcast” in window 2. 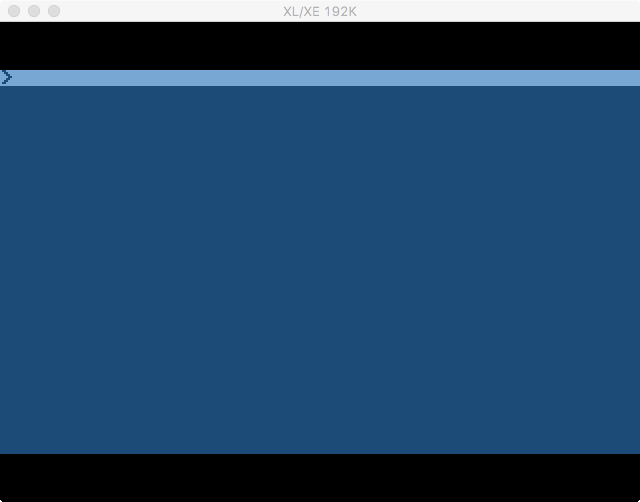 The next post will include functions for positioning the virtual cursor, and for putting single characters to a window. In this post I show how the windowing system close routine works, as well as introduce a window titling routine. All of the routines presented here are part of the window library LIBWIN.ACT. The close routine takes one parameter when called – the window handle to close. Windows can be closed out of sequence, but new windows should not be opened until all the topmost windows have been closed. If you do want to close and open a new window in the middle of the stack, the window size of the new window MUST be identical to prevent overwriting another windows screen buffer memory. First it sets the default return code to an error code of NOT OPEN. This assumes the window handle specified is not currently open. It then computes the location of the windows handle within the window handle memory. Then, if the windows handle status is free, the routine exits passing back the default error code NOT OPEN. If the windows handle status is not free, it computes the location of the top left corner of the window in screen memory, then restores the screen contents the window was covering one line at a time from top to bottom by copying the saved screen contents from the windows screen buffer memory. Then the windows screen buffer memory is cleared and the pointer to the next free space is moved to the start of this windows screen buffer memory. Last, the window handles attributes are reset, the return code of 0 (good) is set and the routine exits. The title routine sets the windows title. It requires two parameters; the window handle, and a pointer to the string containing the title. Titles should be at least 4 characters smaller than the window width. If successful, it returns 0 (good). If something went wrong, it returns an error code. First a default error return code of NOT OPEN is assigned. This assumes the window handle specified is not currently open. If the windows handle status is used, it builds a string to present in memory which is a copy of the passed title, but includes bookends. 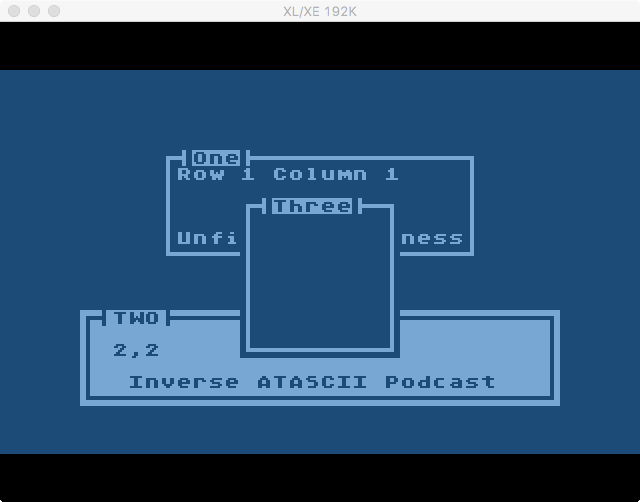 This string is then converted from ATASCII to internal character code because the string will be copied directly into screen memory rather than through CIO. If the window was specified as inverse, the entire built title string is inversed including the bookends, otherwise just the title is inversed. Finally, the titles location in screen memory is computed, and the built title string is copied directly to screen memory to that location. Then the return code is set to 0 (good) and the routine exits. DEFINES.ACT – Definitions used by my Action! library routines. LIBMISC.ACT – Miscellaneous functions. Pulled in for WaitKC(). Notable changes in the demonstration program are the addition of the WTitle() lines, WClose() lines, and the WaitKC() line. Running the demonstration program produces the following. 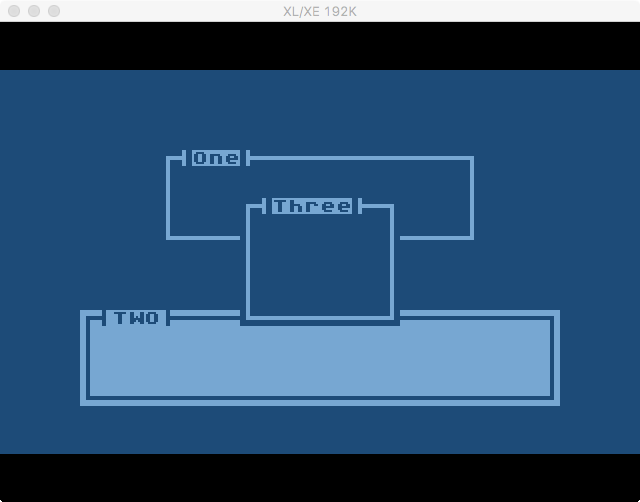 The first screen shot is after the windows have been opened with titles applied, and is waiting for a keystroke. The wait was required due to the window system speed. Without the wait, it would just blink. Yes, its that fast. The next post will include a routine to print a string to a window, and a routine to clear a windows contents.